Hey guys! 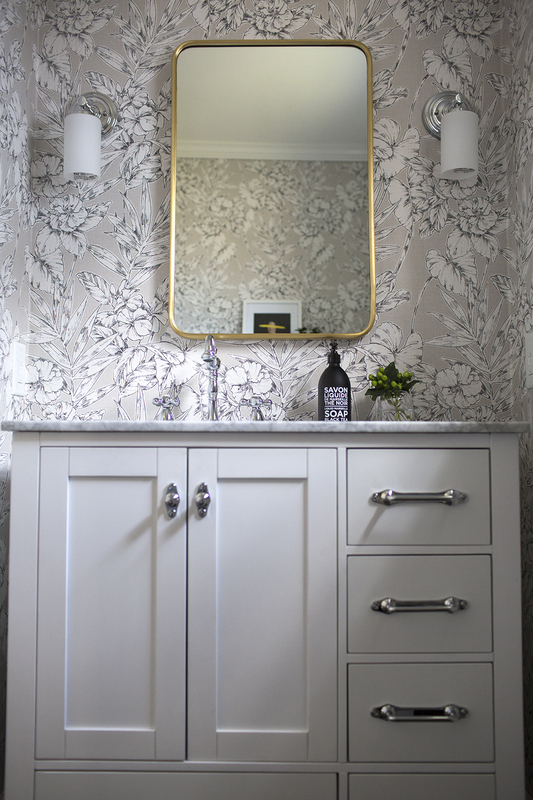 It’s Jacqueline, checking in to give you a long overdue look at our completed powder room. We have been about 90% done with this room since November and have been dragging our feet to finish it ever since. 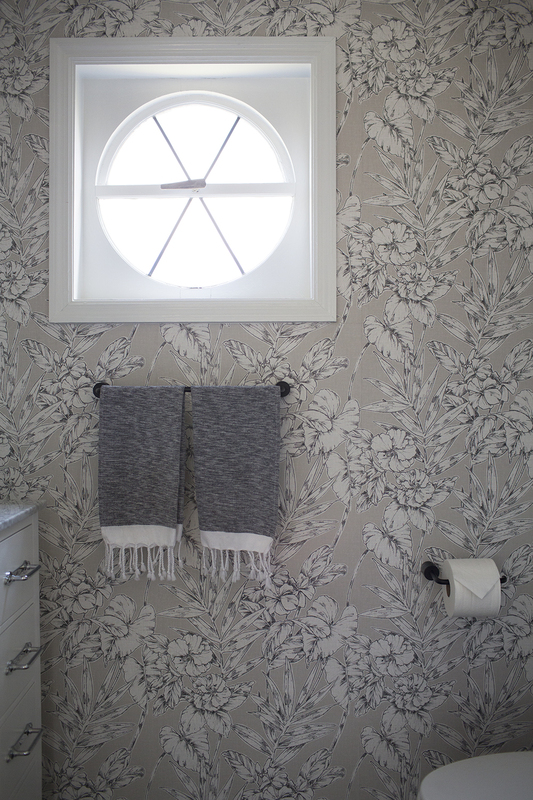 This is one of the last projects to tackle in our home… for some reason we saved both bathrooms for last. However, that doesn’t mean it wasn’t one of the worst rooms in the house when we first bought it (I’ve included a before image below to prove it). Believe it or not, we lived with this space which sits right off of our main living room for FOUR years before touching it. How? I don’t know. In my mind I turned a blind eye toward it, but every time we had visitors over and they had to use, it I cringed. 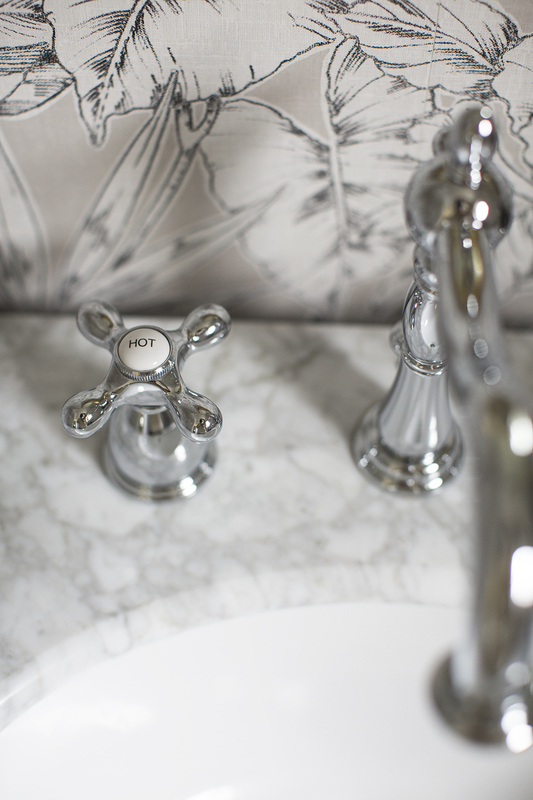 We even had friends joke that they wanted to buy the vanity and sink from us when we renovated. I’m happy to say both of those pieces are long gone and I’m feeling much better about guests using the powder room when they are over for a visit. See more of the completed space including links for everything below! 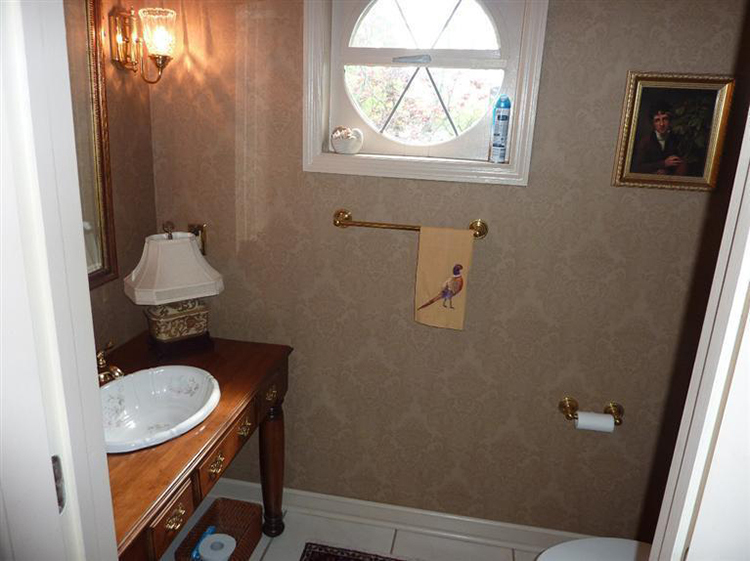 This is what the powder room looked like before we moved in. Yikes. From the makeshift “table vanity” with two legs to the floral sink and 90’s brass everywhere- it had to go! I still can’t believe we lived with it as long as we did, but hey- that’s life sometimes when you’re trying to update an entire home. Another example of how renovations don’t happen overnight. I’ll address the wallpaper next because I’ve been getting so many questions about it on Instagram! 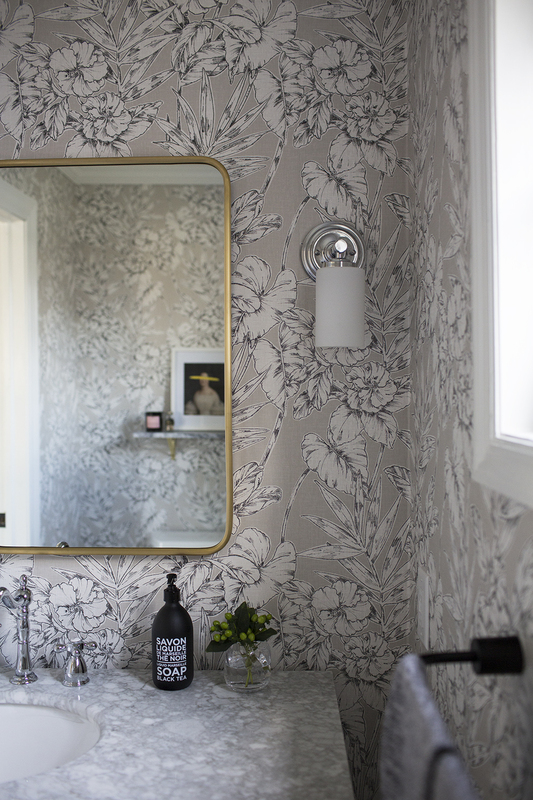 I fell in love with this Fiji Garden Wallpaper and knew it would be perfect for the powder room. 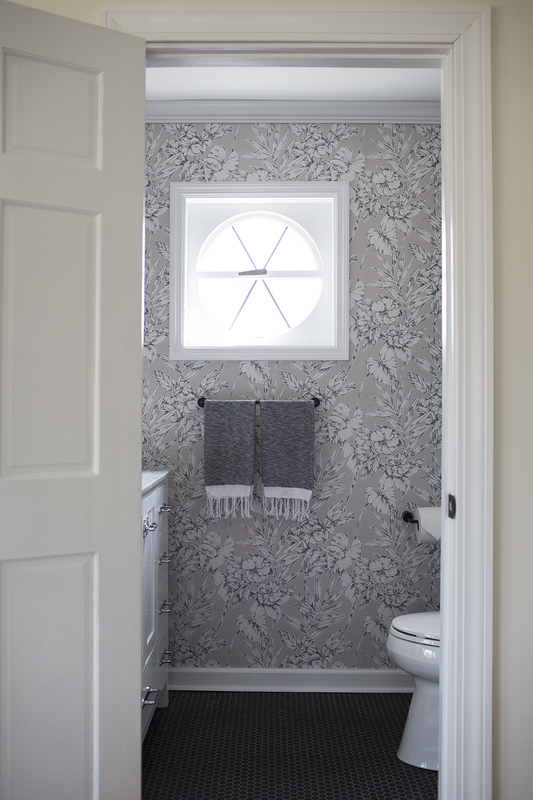 I love to go bold in a small space- either with fun wallpaper, a dark paint color or beautiful millwork. Although we considered all three, we landed on the wallpaper and definitely don’t regret it. My father-in-law helped us with install again just like he did in Luca’s nursery. 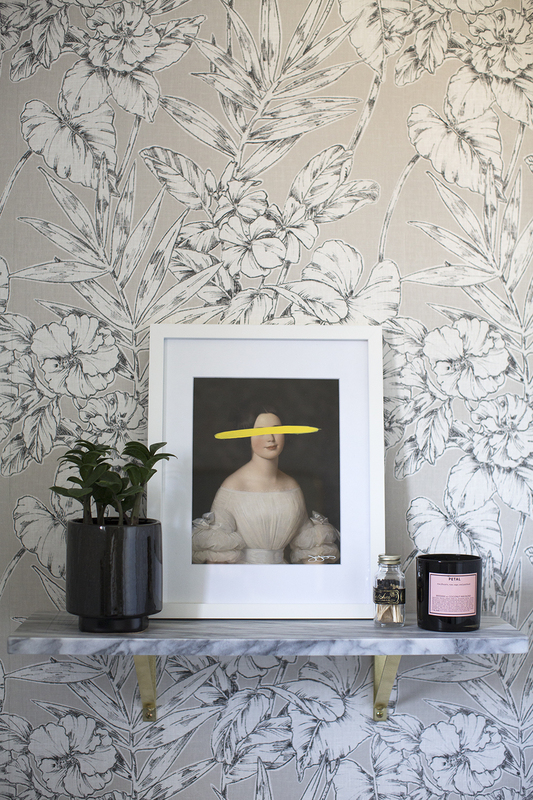 If you remember, I shared a beginner’s guide to wallpapering post prior to revealing that room… definitely worth a read if you plan to tackle wallpaper somewhere in your home. If you look carefully, you’ll notice I mixed a few metals in this project. I actually chose three- chrome, brass, and black. 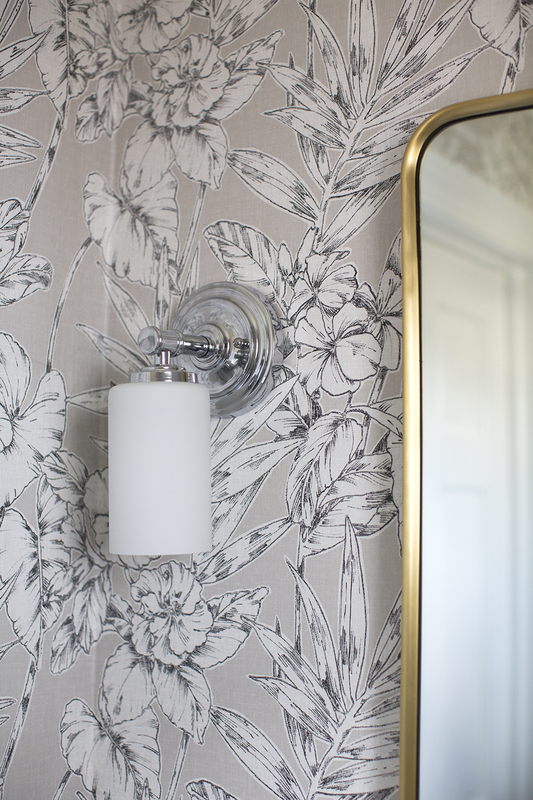 Chrome was my primary finish used in the sconces, faucet and vanity hardware. Next, I used brass and black as accents (seen in the mirror, towel rack and toilet paper holder). Due to their placement in the room, they all work together nicely without competing with one another. 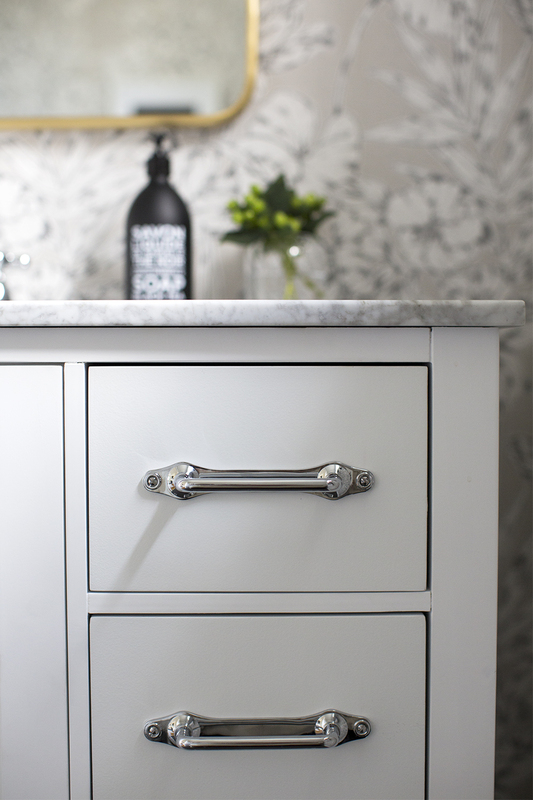 I purchased the vanity from Wayfair and wasn’t loving the original hardware that came with it. With the help of a little wood filler and paint we filled in the existing holes and added new cabinet knobs and pulls. They added so much personality to the vanity and brought my vision to life! It’s amazing how such small details can really make a huge difference. I’ll be sharing some of my favorite hardware from Rejuvenation here next week! Some of my other favorite details in the room include the gorgeous ‘Emma’ print from Josh Young Design House (which sits on a cute little shelf above the toilet), a faux-marble waste basket, the Waldorf privacy door knob from Nostalgic Warehouse and the Turkish hand towels from Amazon (which come in a pack of four for about $20). 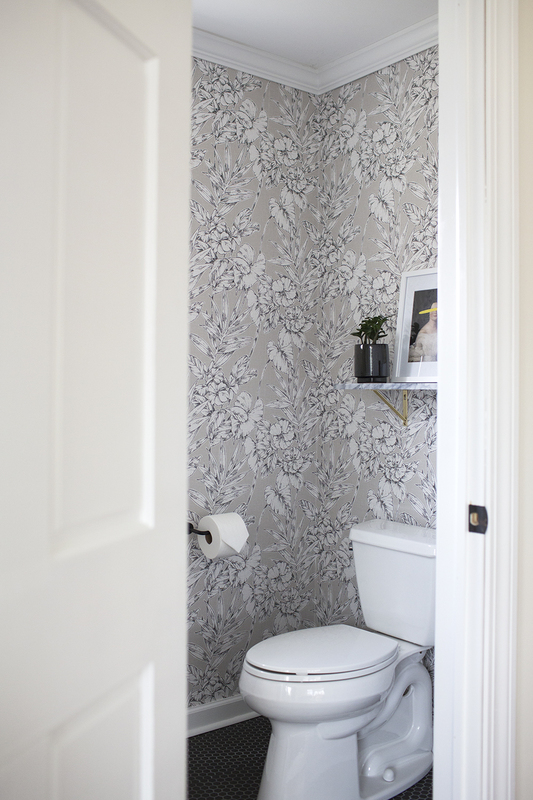 Before renovating the bathroom, the door didn’t have a privacy lock- and for a powder room that is KEY (quite literally, ha!). 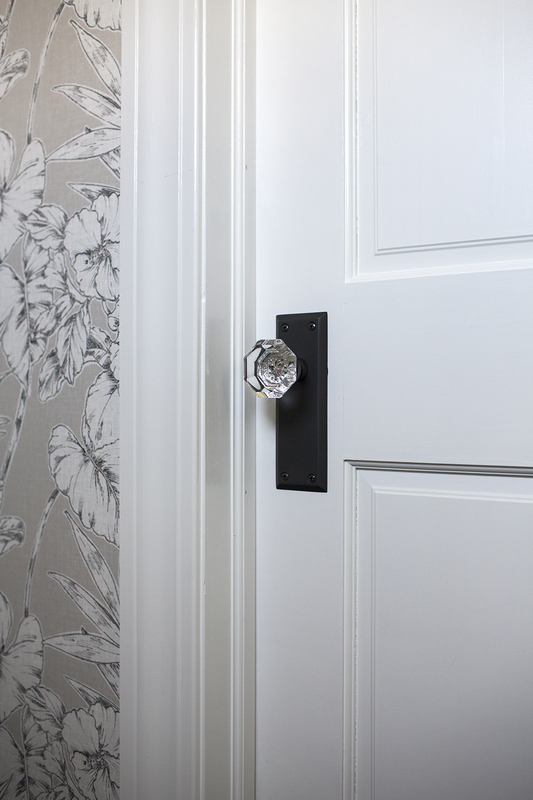 Swapping the door hardware will hopefully make guests feel more relaxed. The previous doors not only didn’t have a lock, but they were saloon style doors, which wasn’t great for a powder room right off of a main living space. They opened very wide and exposed the bathroom. There is nothing worse than having guests feel uncomfortable when they come to your house. Now anyone who visits can lock the door and feel at peace while doing their business. We will also be tackling this privacy / door issue in our main bathroom once we begin that project (I’d seriously love to know what the previous homeowners were thinking). Overall, I’m really pleased with how this bathroom turned out. It is finally representative of my aesthetic and feels like it belongs in our home. Do you ever feel like one room just doesn’t fit? That was this space. I’d love to know your thoughts on the reveal, the before & after images, questions about the project…you name it! As always, you can find all of the product links as well as a “get the look” roundup including all of the exact items I used in this project below! Happy Friday, friends! Have a wonderful weekend. Beautiful! Quite an improvement. That wallpaper is smashing, and I love the black floor. So, so pretty. Happy Friday! Thank you, Peggi! Glad to hear you like it. It’s definitely much better than it was before. :-) Have a great weekend! I agree with Peggi’s favorites. Very soothing space and everything ties together so nicely. I love this! I don’t fall in love with monochrome but the level of pattern here keeps it from appearing underdecorated. 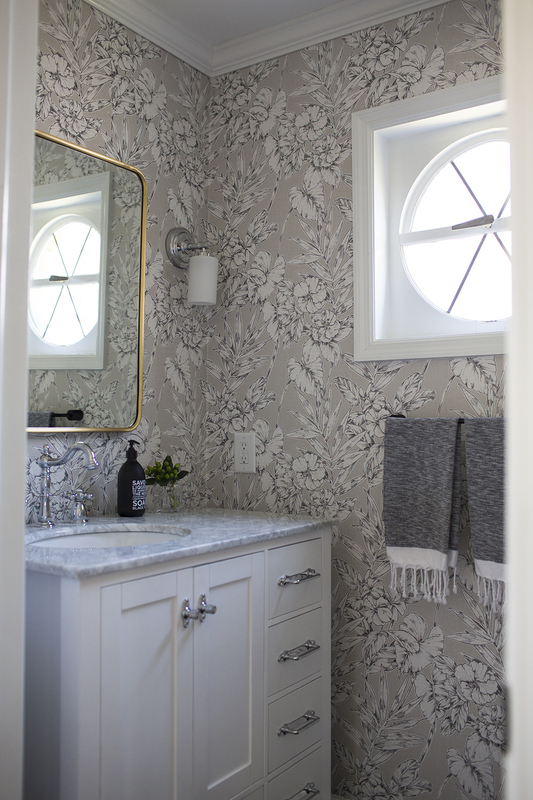 My favorite thing is how the dappled marble countertop feels similar to the dappled light on the flower pattern! Beautiful, and SO much better than the setup you had before – no locks?!? Ack! Aww thanks, Julie! 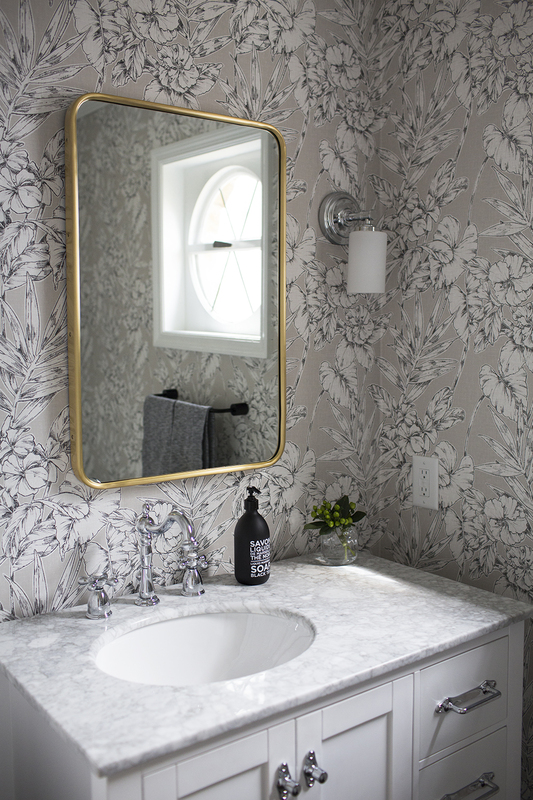 The wallpaper is definitely a “wow” factor in this small space. Anything beats what was there before…ha! And I wasn’t lying about the saloon style doors…they were terrible! So glad to see those gone. Thanks, Ardith! The wallpaper is definitely one of my favorites aspects of the room. I’m glad you enjoyed it too! Jacqueline this is stunning!!! So much inspiration and style packed in a small space. Love what you did!